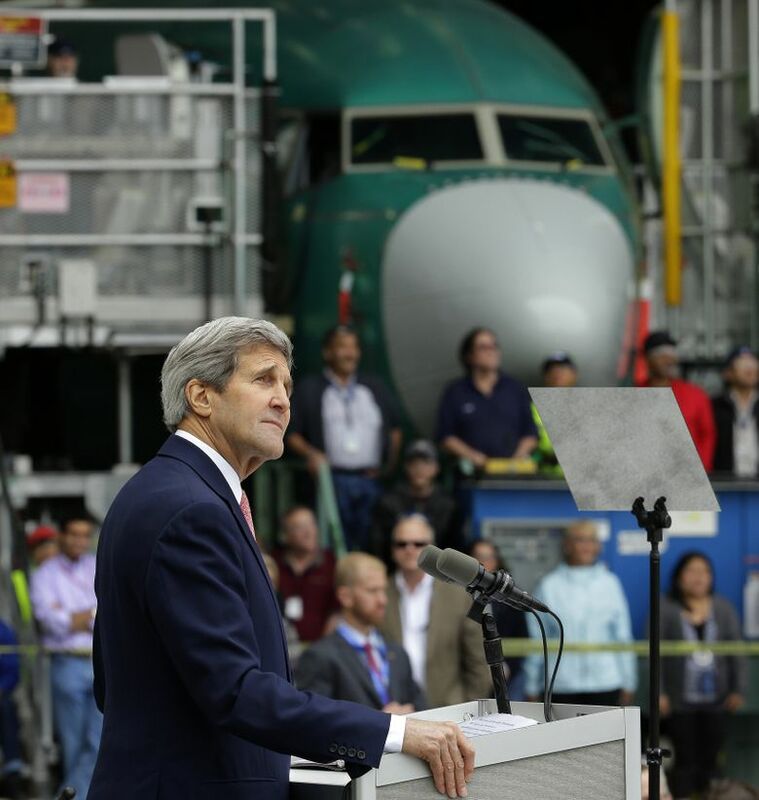 Secretary of State John Kerry used Boeing’s 737 plant in Renton on Tuesday to defend a Pacific Rim trade deal being negotiated by the Obama administration, arguing it will benefit American workers. 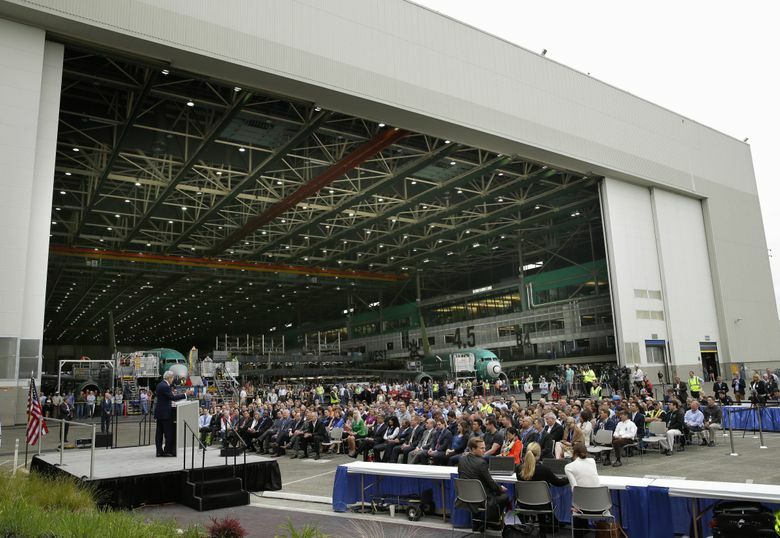 With Boeing’s 737 plant in Renton as a backdrop, Secretary of State John Kerry on Tuesday defended a Pacific Rim trade deal negotiated by the Obama administration against criticism from unions and prominent congressional Democrats. Kerry said opponents of the proposed Trans-Pacific Partnership (TPP) — a pending trade pact among 12 countries including the U.S., Japan, Vietnam and Canada — are wrong to blame international trade for ills such as income inequality or offshoring of U.S. jobs. Kerry urged Congress to give President Obama the “fast-track” trade authority he’s seeking to finalize the TPP agreement, which would then be sent to Congress for an up-or-down vote. But Kerry’s visit spurred protests from critics — including the union representing Boeing machinists — who argue past trade deals have caused the losses of U.S. jobs to cheaper foreign labor. “We’re only interested in trade deals that work for working Americans, and we want his support for exporting our airplanes, not our jobs,” Jon Holden, president of Machinists Union District Lodge 751, said in a statement Tuesday. The debate has split the Democratic Party, drawing heated opposition from some leaders in the progressive wing, including Sen. Elizabeth Warren, D-Mass. 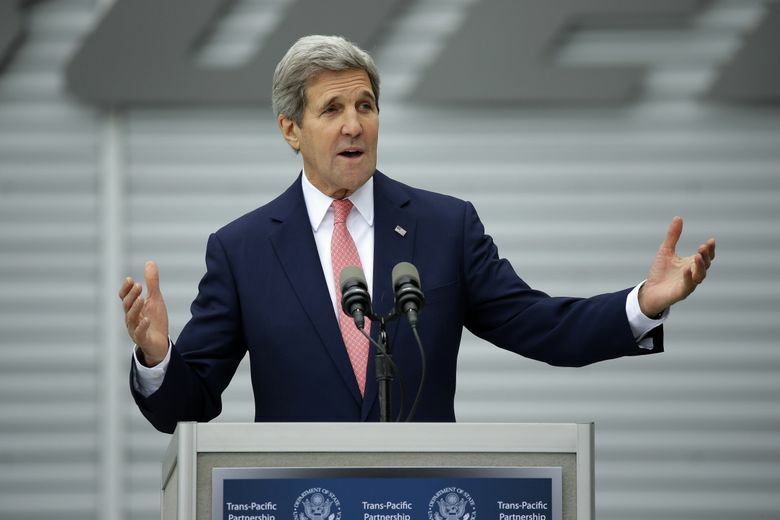 Kerry, a former U.S. senator and presidential candidate, confronted such objections as “empty protectionism” during his speech to a small audience of Boeing workers and pro-trade guests, including Gary Locke, the former governor and ambassador to China. “There is nothing progressive about blaming trade or trade agreements for the inevitable economic shifts that are brought on by technology and time,” Kerry said. The U.S. cannot grow its economy without selling to foreign markets that include most of the world’s consumers, he argued, saying the TPP agreement contains unprecedented provisions to lift standards for workers across the globe. Kerry cited tariffs that currently limit Washington exports, including a 17 percent markup on Washington apples in Japan and tariffs on wine as high as 50 percent in Vietnam. Jeff Johnson, president of the Washington State Labor Council, said Kerry and other TPP backers are misleading the public when they suggest the choice is between a secretly negotiated trade pact and no trade at all. “We sell a lot of planes and apples. We are going to keep selling those planes and apples whether TPP passes or not,” Johnson said in an interview. He blasted the Obama administration’s lobbying for fast-track authority, which has included personal appeals to Democrats in Washington state’s congressional delegation. Johnson said he was personally insulted when White House officials recently suggested during a phone call that he and other critics stop dividing Democrats with opposition to the deal. Kerry’s Seattle-area stopover came after a weekend visit to China and South Korea, and the Democrat noted he’s practically lived in the Boeing 757 that has shuttled him to 63 countries over the past two years. His speech Tuesday was interrupted a couple of times by the roar of jets taking off from the nearby airfield — which Kerry led the crowd in applauding. The Renton site may not have been Kerry’s first choice, The Associated Press reported Tuesday. The State Department had been looking at sites in Seattle, but the Port of Seattle advised that ongoing protests over Arctic oil drilling meant it was better to look outside the city. As a generally progressive but pro-trade region, the Pacific Northwest’s congressional delegation could be a bellwether for the trade vote, said Eric Schinfeld, president of the Washington Council on International Trade. “This is a huge opportunity for us,” Schinfeld said, noting Washington’s status as the most trade-dependent state in the nation, with an estimated 40 percent of jobs tied to imports and exports. Republican leaders in Congress have generally been supportive of the fast-track authority. The Senate is debating the issue and may vote as early as this week. But the choice has been tougher for some Democrats torn among business interests, the Obama administration and union critics. Both of Washington’s U.S. senators, Democrats Patty Murray and Maria Cantwell, back the fast-track authority legislation while supporting amendments to improve it, their offices said this week. The Senate is considering related legislation and amendments that include benefits for workers displaced by offshoring and reauthorization of the Export-Import Bank, considered crucial for exporters including Boeing. Rep. Derek Kilmer, D-Gig Harbor, issued a generally supportive statement Tuesday, saying he agrees with Cantwell and Murray’s approach regarding the “opportunity to get a new kind of trade pact” that would be a boon for workers, the environment and businesses. Rep. Jim McDermott, D-Seattle, voted against a version of the fast-track authority bill in the House Ways and Means Committee, but his office said he’ll review the final package before making a decision when it returns to the House. Rep. Dave Reichert, R-Auburn, has been strongly supportive of the fast-track legislation. Other Puget Sound-area U.S. House members remain officially noncommittal, including Rep. Adam Smith, D-Bellevue; Suzan DelBene, D-Medina; and Denny Heck, D-Olympia. Rep. Rick Larsen, D-Everett, said in an interview Tuesday that he generally supports the ability of presidents to negotiate trade deals with congressional input. Larsen is among the House Democrats who have been personally appealed to by President Obama on the issue — over a teriyaki lunch with three other lawmakers. But Larsen said he’s not ready to commit to a vote on fast track or TPP until he sees the final product. “Trade isn’t religion. It is politics. It isn’t good or bad. It is fallible. Specifics matter,” he said.